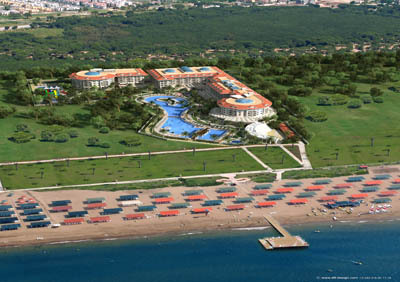 The Sea Worl Resort & Spa Hotel is situated in Kizilagac, Manavgat. Manavgat is just 10 km, Side 15 km, Antalya airport 70 km away. 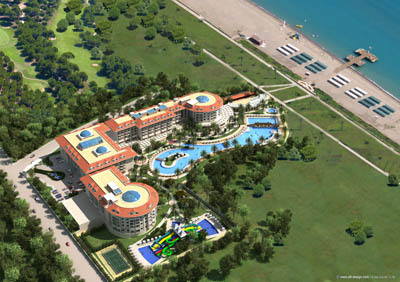 Reception, main restaurant, 3 a la carte restaurants, 7 bars, outdoor swimming pool with children's section, indoor pool with children' s section, meeting rooms. 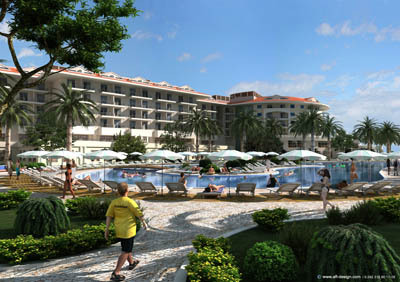 Aquapark, jacuzzi, fitness, beach volleyball, table tenis, tenis courts, dart, boccia, chess, aerobic, step, beach volleyball, animations, mini-club (4-12 age), disco, wireless internet connection in the lobby. 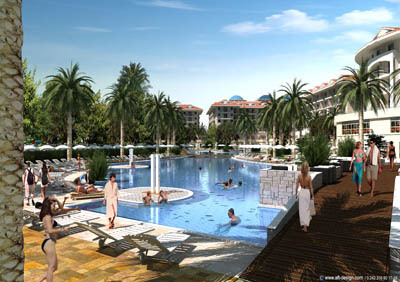 Imported drinks, safety box in the rooms, telephone, spa center, sauna Turkish bath, massage, peeling, lightning of the tenis courts, tenis rackets and top, billiards, bowling, laundry, internet, motorized water sports, diving school room service, Vitamin Bar, Wine Bar, VIP bar. Bathroom with bathtub and hairdryer,air-conditioning, plazma TV, safety box, minibar-refilled once a week with soft drinks and beer, telephone, balcony. Situtated directly on the beach. Sunbeds, umbrellas and mattresses available free of charge. Dinner in a la carte restaurant (once per week). In the afternoon snack in the pool area, coffee break, Turkish pancakes gozleme, fruit and ice cream in certain time. Midnight soup.